What should probably be considered the bare-minimum caliber for self-defense, the 32 ACP has been in service for over 100 years and has recently seen a resurgence in the United States as the individual state governments have begun to ease restrictions on the Second Amendment and again allow citizens to carry handguns for self-defense. Popular in this role is the ’mouse gun’ or ’pocket pistol’ because they are so small and easy to carry. Recent advances in material science and aggressive engineering by pioneers such as Kel-Tec have made pocket guns both concealable and reasonably easy to shoot without extensive practice. Where the trouble starts is with the terminal ballistics of the cartridge itself. When a visitor to the website asks me to make a recommendation of either gun or caliber, my first question is: ‘what is your experience level?’ By ‘experience level’ I mean ‘formal training by a firearms professional.’ There is no replacement for training—this is why governments around the world spend so much money on military training exercises. I strongly recommend a 32 ACP mousegun for a casual shooter looking for a CCW handgun. It may be appealing to go to the 380 ACP but it takes moderate practice to be able to use such a gun with any skill due to the recoil. The 32 ACP is capable of moderate expansion and reaching FBI-standard penetration depths in ballistic gelatin. Most factory ammunition in mousegun calibers appears to emphasize expansion more than penetration. To date, I have not tested factory ammunition that can expand and penetrate to 12.0” in ballistic gelatin. The only way to achieve moderate expansion and adequate penetration is to handload Hornady 85gr XTP bullets over a hot charge of pistol propellant. This is not to say that factory loadings are not adequate—much the contrary. A 32 ACP JHP performs better than a 380 ACP FMJ on the shallow shotlines like hits to the arms and legs of an attacker (a very frequent occurrence given the stress of the situation) but falls flat on solid hits to the chest—the penetration is not great enough. Some have suggested ‘staggering’ the rounds in their 32 ACP such that one shot is a JHP, the next shot a FMJ, the next shot a JHP and so forth. I recommend this approach as well for 32 ACP. A bullets ability to wound and subsequently disable an attackers body revolves around the fluid drag acting on the bullet and the location in the body at which this occurs. 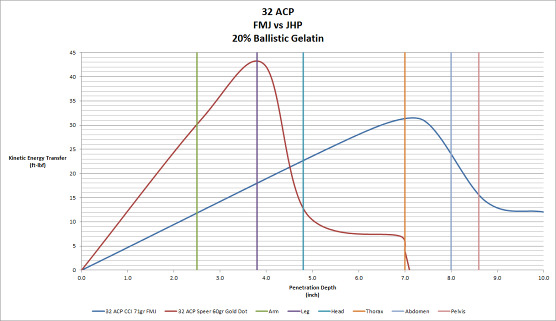 One end of the spectrum would be a 32 ACP JHP which penetrates to 7.0” in 20% ballistic gelatin. 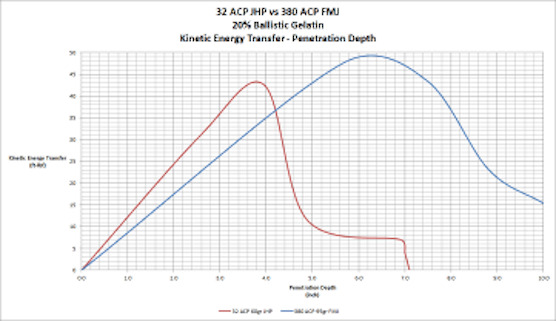 Very deep penetration can be had with a 32 ACP FMJ which penetrates to 11.2” in 20% ballistic gelatin. The graph at the left illustrates the kinetic energy transfer of these bullets, overlaid with the depth in the human body that this penetration corresponds to. We see that the 32 ACP Speer 60gr Gold Dot JHP transfers the most kinetic energy at depths encountered by the leg. The implication of this is that the bullet can also reach and damage any structure located within an attackers arm. On the other hand, the FMJ bullet maximizes its damage in the thoracic cavity—making it the ideal round on shotlines involving the chest. These two examples illustrate the point that bullets can be ‘tuned’ to damage the target maximally on different shotlines in the body. Since JHPs open almost instantly, this sort of tuning of the gyroscopic stability of a bullet is most applicable to FMJ bullets. If you make an FMJ bullet less stable (slower rifling twist for instance) it will tumble earlier in the gelatin block than if it were more gyroscopically stable. To the right you will find an example experiment where I did just that : I ground a flat surface into the nose of the CCI 71gr Blazer bullet using a bench grinder. This reduced the stability of the bullet and created a homemade ‘spoon round’ which is factory made for just such a reason. Illustrated in bright red, the Spoon Round demonstrates its ability to do the greatest amount of damage to the arms while still penetrating deeply enough to damage the other body structures.